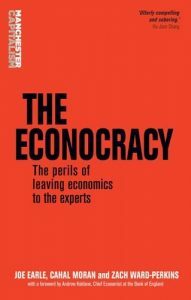 What to do about the econocracy? What’s not to like when students of economics are passionate about their subject and engaged in how it should develop? I don’t agree with the authors of The Econocracy and their wider network (Rethinking Economics) about absolutely everything, but heartily applaud their engagement. In fact, I do agree with quite a lot of what they say about the subject and particularly the way it’s taught, which is why I organised a conference on this subject at the Bank of England in early 2012 (here’s the book of the conference papers), and have since been committed to working on the CORE project and its free online textbook The Economy. What’s more, one of the authors of The Econocracy, Cahal Moran, is the TA for my public policy economics course at Manchester. So this is the context for my view of their book. It starts with a quotation from Albert Camus: “Each generation doubtless feels called upon to reform the world. Mine knows that it will not reform it, but its task is perhaps even greater. It consists in preventing the world from destroying itself.” How much more apposite that seems now than it must have when the book was written. Many, probably most, economists knew even before the disdain for ‘experts’ set in this year that there was still a legacy of the financial crisis in terms of thinking about the character of our subject and also how it’s taught. This only seems more urgent now, even if you firmly believe – as I do – that there are some nonsense criticisms, and that economic research is in a better state than you would know from either external criticism or the undergraduate curriculum. Some economists need to be more self-critical for sure, and more open to other perspectives. The incentives for the kind of research that is done and published urgently need to change – a problem at least as much to do with the structures of universities and the REF as internal dynamics. Economists need to communicate far, far more, and better, with the public. And, yes, how we teach needs to reflect far better the innovations in recent research (such as behavioural economics, or cross-disciplinary institutional work), as well as reintroducing economic history, methodological questions, and the real world. The Econocracy isn’t a million miles away from this view. It rightly highlights the influence of economics courses on public policy. Many of today’s influential policy makers were taught their economics in the late 1970s or 1980s, the heyday of the most ludicrous free market/rational expectations version of the subject. It was around then that students stopped being taught even basics such as national income accounting and recent economic history. Even worse, the legacy is a generation or two of policymakers who think the world is something like the textbooks. The first chapter highlights a couple of examples, including cost-benefit analysis. This is a bugbear of mine because it’s a tool for marginal, linear changes, applied indiscriminately. However, I don’t believe the solution is to ditch CBA, because it is always going to be applied implicitly if not made explicit. Better surely to try to improve it by aiming to include non-linear effects, take account of externalities, make judgements explicit (as in the public value framework) – simply, to use it with more humility rather than applying it mechanically. The book acknowledges the work of CORE and the similarities of diagnosis between the two initiatives. I think the authors are wrong to see CORE as a reformed version of the status quo, and to suggest that we don’t think there’s anything wrong with economics in itself, just with the way it’s taught. They state that CORE only includes methodological individualism, which is incorrect, and that the sense of disputes among economists is confined to the history of thought sections, also not correct. However, there is a key difference between our approach in CORE and the Rethinking solution to the problems of both the subject and the teaching of it. They call for pluralism, the doing and teaching of economics from a range of different perspectives. This sounds perfectly fine, but they contrast it to:” A narrow, fixed body of knowledge is handed down from one generation to the next leaving little room for debate.” These are false opposites. It is possible to combine a wide and evolving body of knowledge with the quest to establish, well, knowledge and not opinions. I am not interested in an economics of competing theories and world views; we do better work as economists when we listen to these, confront them with evidence and careful statistical or logical reasoning, and try to establish a bit of knowledge – context-dependent and historically contingent as it might be. In the latter addendum to his famous Two Cultures essay, C.P Snow described the social sciences as a third culture, in between the sciences and the humanities. This is an uncomfortable but essential position. I really don’t see economics – as The Econocracy suggests – as just another strand of the liberal arts. (I’m not sure pluralist economists really think that either – isn’t a Marxist economist just as convinced on average as a neoclassical economist that she is right?) Still, I’m certainly prepared to try and be open minded about any specific ‘pluralist’ economics, as long as they’re prepared to specifiy logically-consistent theories and do careful econometrics to test their hypotheses. Despite this pretty important difference, I very much agree with a lot of the book. Any economist involved in teaching would do well to read it and reflect. It makes interesting observations about the modern university, although without (I think) solving the key dilemma about how to make university education (and assessment) work well for students in an era of mass access to HE. Many university teachers (me & many others!) truly want to deliver the best possible education – lively, interesting, horizon-expanding, promoting critical thinking, delivering important life and work skills – and all this is labour-intensive and (as the book observes) not valued in promotion decisions or professional rewards. I particularly agree with the conclusion: “We believe that economics must be brought back into the spotlight of democratic scrutiny. Economic decisions must be taken as part of a public discussion.” Always true; truer than ever post-2008 and post-2016.